Tyranny of the Muse is a story based around Frank Fisher, a fractured puzzle of a man who is struggling for direction. A failing writer, his is a life steeped in self-loathing and misery, and his growing “inspiration addiction” has him gasping for his next ‘fix’ courtesy of the similarly enigmatic Bonnie. Bonnie serves as the titular “muse”, but her method of inspiration is far from traditional. While Fisher is clearly infatuated with her – obsessed, almost – she retains an aloof indifference for the most part, instead administering her ‘seeds of inspiration’ via a painful injection directly through a festering wound into his brain. Yeah. 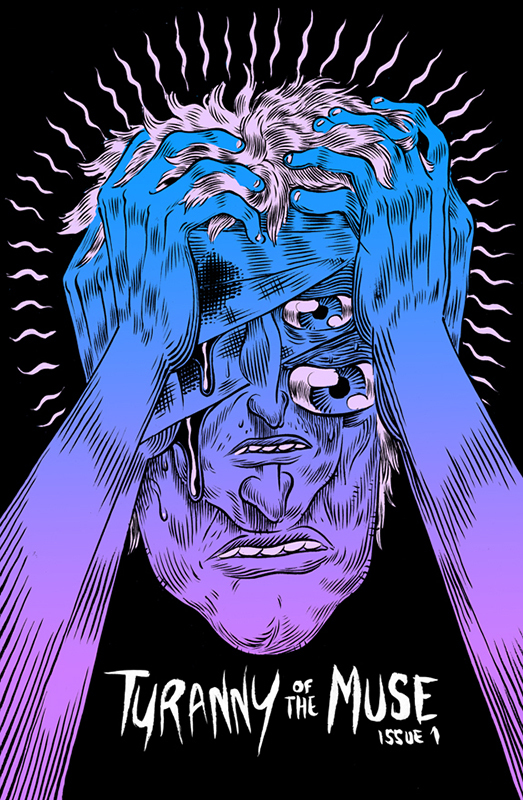 It’s a fairly graphic premise, and one that artist Jesse Balmer takes great pleasure in showing us in gruesome detail. Balmer’s artwork has a surreally grotesque quality to it, and reminds me greatly of the work of Scottish artist Iain Laurie, whose contributions to likes of ‘And Then Emily Was Gone’ I’ve tirelessly extolled the virtues of in the past. Balmer adds his own unique wrinkles though, and while there is an undeniable shock value to many of the panels, there’s also clearly a lot of talent on display here as well, particularly in his subtle use of facial expressions. A large portion of this book is devoted to a back-and-forth conversation between Frank and Bonnie, and writer Eddie Wright showcases his abilities here as he creates a situation loaded with subtext and mystery. Fisher’s growing desperation and instability bleeds over as we are given an insight into his neurotic relationship with Bonnie through his inner monologue, leading to a tense, awkward exchange with a satisfyingly abrupt conclusion. Tyranny of the Muse is a book with an unconventional style, both visually and in terms of the tone. It’s definitely not going to be a comic that appeals to everyone, but I have to say, I found myself strangely intrigued with this odd protagonist and his growing neurosis. This is an up-close character study of a desperate man struggling with addiction and willing to do literally anything to make him feel like somebody again. Dark, surreal and almost suffocatingly bleak, I found myself drawn into disturbing nature of the story, like a car crash you just can’t tear your eyes away from. And I’m definitely planning on picking up the next issue to see just how the relationship between Bonnie and Frank plays out now that he has received his latest “inspiration fix”. Not one for everyone, but definitely one for me. Captivating stuff. Check out the official Tyranny of the Muse website for more details of the ongoing series. You can also pick up a copy of the first 48-page issue at the Birdcage Books online store.